Regarding Idlers and "Belt Walk"
One issue that has come up has been with the idler mounts (and to some extent, the X carriages). What we've found is that over time the printed parts can deform from the stress of the belt tension. This will allow the idler bolts to lean. When they lean, the belts ride up on the idlers and rub on the top of them. The teeth grabbing the top edge of the idler cause the belt to lean in and out as it changes direction, very subtly changing the belt length. In prints it creates artifacts in X/Y. 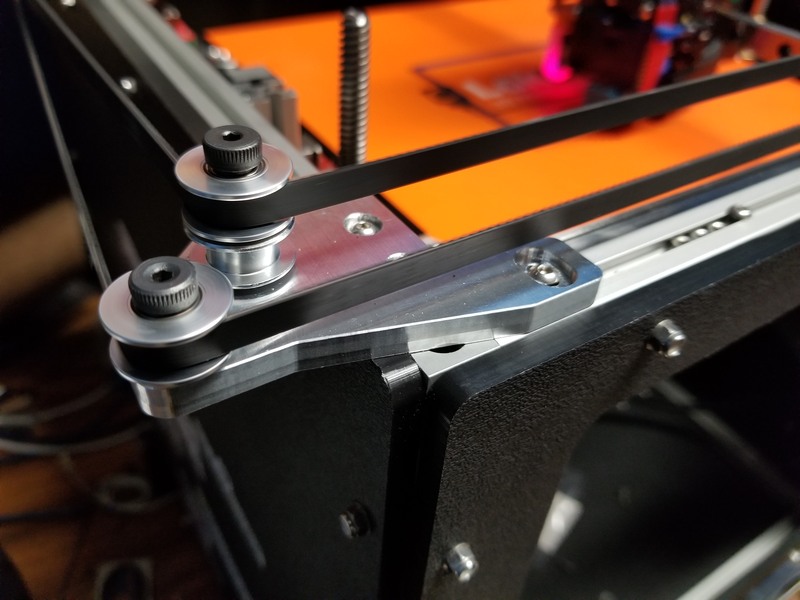 We tried different versions of printed idler mounts and X carriages, and they can solve the problem for a while, but within 1 - 3 months, the bolt will lean again. The print issues, while minor, are frustrating. We tried CF petg, PLA, CF PLA, PC and CF PC. Eventually all of them will lean, though some last longer than others. So we've worked with 713maker to come up with a solution specifically for the idler mounts. I know people have been waiting on these, and we finally have it. The solution was to ditch the design used for the printed parts, and go to a flat plate similar to the stepper mounts. We then paired that with high quality steel shoulder bolts. This means the idler stacks won't lean, and the belts don't rub. Steve received his idler mounts yesterday, and I got mine today for testing. They are rock solid, and won't change over time. Going forward, I recommend either purchasing the aluminum mounts, or being aware that you may periodically need to reprint your idler mounts. To full put the issue to rest, we're working with another maker, and hole to also soon have machined X carriages using the same shoulder bolt approach available. This one took a while to solve, but I think it's finally done (and I think the idler mounts look fantastic... and will also allow for a top to be put on easier). Thanks to Matthew White at 713Maker.com for all the help in tracking down this issue, through MANY iterations of idler mount designs.